I do not know whether CNNE was the hero, or anti-hero of this week, but one thing is certain, it revealed how fucked up is the chavista mindset. Sorry for the vulgarity but no other word describes it. The latest one I am not going to delve in it much: CNN top international journalists were asked to leave the country for no apparent reason except that chavismo considers that they are not fair and balanced in their coverage. Patricia Janiot, an Latin America star by its elegance and sharp intellect was even searched at the airport this morning where her shoe heels were damaged by security because of "weird spots" while the same X-ray machine did not detect she had forgotten to take out of her bag a small bottle of water. This and other were simply an harassment of her at the airport this morning, including visiting a separate area of the airport, inability to go to the loo alone, etc. all finishing with the top brass telling Janiot that he knew she had no drugs but "he had to do his job". Of course, it is quite possible that Janiot sniffs coke for breakfast but it is absolutely certain that in a trip to Venezuela she would not take the faintest chances. Not this trip only, any trip since the infamous show of Chavez in 2010 when he attacked her in public. And yet we wonder what is going on. For one thing, outside the airport fiasco, Janiot says she has been treated well. On the other hand CNN and CNNE have both been asked to leave and Penfold at CNN was even robbed at gun point. And then CNN was asked back for a Maduro press conference this evening while their official correspondent in Caracas, Osmary Hernandez, had her press credentials revoked. One that is not ambiguous is that Maduro himself announced he wanted to remove CNN from cable offering in Venezuela. Why is he so upset? After all I have been watching CNNE all week long because I had no other option and I can assure readers that CNNE had PLENTY, if not more coverage than the opposition side. What gives? The regime does not care whether CNNE covers its actions, what the regime wants is that the opposition gets ZERO coverage. Period. Which bring me to the second event. Patricia Janiot bravely tried to hold a debate between three pro government students and three opposition one, one of them actually being to the left of chavismo, supposedly. Though in my personal opinion anyone is left of chavismo since this one has chosen the fascist dictatorship style of regime. But I digress. First I must take objection to Janiot for trying to force a debate on us. She should know better, that in a country that has suffered a decade of active political discrimination since the invention of the Tascon list in 2003, debate will be possible only when the list is finally discarded and those who used it sanction. And thus it was a failure, Janiot in the second half simply gave up trying to control the debate (shown tonight, first half was yesterday). I am not going into the details of the futile debate, yet happy that it took place to show how dialogue is impossible in the country because representatives of the regime are simply all of a mold, all with the same argument. When you looked at the three "students" of the government you could quickly figure out that they have been well trained with a dozen or so talking point and their only creativity is to bring anything to one of those talking points, whether it makes sense. That is all. As an anecdote I would like to add that the three "students" of the regime are all already well connected, one of then being, I read, the nephew of the Vice President, the other ones unelected leaders of chavista student organization, and all of them whiter than the opposition students. Those all come from positions earned through true elections and severe questioning. The three of them had each one, clearly, their own speech, their own agenda, their own talking points, only sharing a common goal to bring democracy back. Clearly, chavismo is unable to send anyone to the press unless thoroughly vetted by the regime political education and apparatus. I am looking forward Maduro committing the ultimate idiocy of banning CNNE from Venezuelan cable. CNNE has already served its purpose exposing the depth of cowardice and incompetence and intolerance of the chavista regime. I do not know whether they did this on purpose (some segments such as bringing in a mercenary like Ramonet as an expert are, for me, unconceivable at this point) but the fact of the matter is that they brilliantly succeeded, at least in Spanish, in exposing the regime. In this media war, they regime lost that battle big time as even the NYT blogs is unconsciously in awe. PS: for those who understand Spanish Janiot own account Friday afternoon late just as she landed from Caracas. Coverage here in the USA is increasing, but the media, being lazy and uncaring in general, prefer to do little more than pass along pro-government press releases. The BBC had video report in which they interviewed three pro-government supporters on the street, all of whom blamed the protestors for the 'breakdown of the rule of law". No opposition voices were included. Al Jazeera America had a longer analysis segment which featured Eva Golinger, a paid Maduro propagandist. Her lies and distortions about the opposition and events were told with a straight face. It was a disgusting spectacle to behold. To his credit, the segment host challenged her lies, but she is a professional liar and kept to script written for her by the dictatorship. Fox Business has been providing some coverage during the week and it seems basic news objective. However, I think their audience is small compared to the other news outlets. Demonstrations for the students and the people are being held today in Washington DC,New York, LA, San Francisco Ca, Miami FL, West Palm Beach FL, Dublin, and Cork Ireland. CNN US did not even cover the robbery of their own camera crew, thus it is ironic that Maduro expelled them! Millions of Americans are mobilizing to wake up our government, the military has not been asleep. Where in New York are demonstrations being held? I must attend! 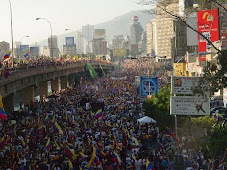 Venezuela chose the wrong time for demonstrations. cf. Ukraine. It is never the wrong time to protest. Where is the Castro lover Stephen Stills??? What about a new song? Coverage in the US has been woefully lacking. Thank goodness for social media, which is helping, but I do wish the news, and particularly the news networks, were covering the situation in Venezuela with the urgency it merits. Thank you for this blog, Daniel. All these hollywood celebs and TV stations that refuse to cover this is beacuase they are leftist Obama voters and dont disagree with the politics. Leftists are a disease, Venezuela is stage 4, USA is stage 2 cancer.